This Chia Bumbleberry Pastries Recipe may contain affiliate or brand partner links. Read our full disclosure here. I have a weakness for pastries. A serious, might-need-an-intervention weakness! I would eat a whole batch of fresh pastries if I could! So if there is any way to make them even a little bit healthier, I’m all for it! This Chia Bumbleberry Pastries Recipe does just that, without sacrificing taste or that sweet tooth satisfaction! Flaky, sweet, and everything that makes a pastry divine, these Chia Bumbleberry Pastries are simply heavenly! Have you ever thought about going to pastry school? Sometimes I think it would be fun! I checked out a pastry school the other day, and there is SO MUCH I could learn! 1. In a pot, combine the fruit, the coconut sugar, chia seeds and lemon juice. Bring to a boil and then turn to a simmer and let it cook for approximately 10 minutes until everything is combined and the fruit has broken down slightly. Remove from heat and let cool. 2. When the fruit is completely cool and thickened, roll out the puff pastry to make 4 pastries with each bundle of dough, or 8 if you purchased a full sheet. Each square of pastry should measure approximately 4 x 4 inches. Preheat the oven to 450 at this point. 4. Bring up the corners of the pastry to the center, and pinch the bottom corners where the sides meet. Pinch all four corners. 5. When all pastries are formed, combine an egg and a splash of water. Wisk well. 6. Brush this egg wash all over the outsides of the pastry. Sprinkle with the demerara sugar. 7. Place in the oven. Bake for approximately 12 – 15 minutes, or until they are golden brown. 8. Remove from the oven and let completely. 9. When serving, heat the vanilla frosting in the microwave for 15 seconds. With a spoon, lightly drizzle the frosting over the tops of the pastries. These Chia Bumbleberry Pastries are the perfect weekend breakfast, mid morning snack, or treat to serve with coffee! And with all the goodness of chia seeds, you get a healthy little pick-me-up with your sweet tooth satisfying pastry treat! Chia Bumbleberry Pastries are the perfect weekend breakfast or treat to serve with coffee! Don’t these Chia Bumbleberry Pastries look decadent? They’re just the thing to nibble on while reading a good book and sipping a cup of coffee! In fact that is EXACTLY what I’ll be doing this weekend! Need more tasty recipe inspiration? Check these out! This is such a great way to enjoy chia seeds! I think they will pair perfectly with my favorite tea, Thanks! Looks so yummy and easy too! Thanks for sharing, I can’t wait to try it! Pinning for later. These are just perfect for a fun brunch. Thanks for joining us at Tasty Tuesdays this week! I love pastries, Jennifer, and these look fabulous!!! Thank you so much for sharing at this week’s Project Inspired. Hi Jennifer, I also love pastries! They do look simple enough, thanks so much for the recipe. wow these look lovely. These would be so nice for a treat breakfast at the weekend. The recipe looks straight forward too- I must try them! So perfect for afternoon tea party! Thank you for bringing this delicious treats at this week’s Fiesta Friday party! Looks so good! Thanks for sharing at the #InspirationSpotlight party @DearCreatives Pinned & shared. Your recipe is featured on Full Plate Thursday this week. Thanks so much for sharing with us and enjoy your new Red Plate! These look so delicious. I can hardly wait to try them! Wow that looks so good! Thanks for linking up at the Dishing It & Digging It Link Party. Hope you made some new friends and had fun! Have a great weekend! P.S. In your share – tweet button settings you have one too many “@” symbols. remove one and you’ll get more notifications when people tweet your stuff. 🙂 I had to remove one of them when it popped up. Thought you’d wanna know. 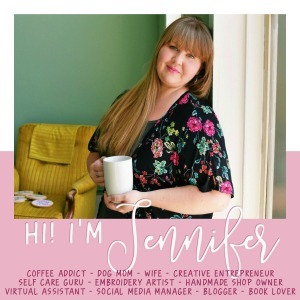 Oh Jennifer – this looks incredible!! Thanks for sharing your great recipes at the What’s for Dinner party. I Would love to try this yummy recipe !!! A great Saturday breakfast! Thanks for sharing at the What’s for Dinner party. Have a wonderful week! Chia seeds and pastry sounds so good. Will try it sometime. Thanks for sharing these at Fiesta Friday, they would be a hit at a party. Yum, I just pinned this recipe. I will be making it for New Year’s. These look delicious! I have been obsessed with frozen blueberry strudels lately. I will try these for a healthier version! What a delicious treat! Thank you for bringing your yummy pastries to Fiesta Friday!